The Olil clinic finished Sunday. Everyone who participated had a great time and learned a lot. This was her second Clinic in the US and we are so happy she came and we can't wait for her to come again next year. Debbie Cook, Election Committee Chair reports the following results. Ásta, Kari, and Susan will serve three-year terms effective immediately. We are back home after a great trip to Sweden where Will participated in the Stockholm International Horse Show at the Globen Hall in Stockholm. Johan Häggberg was very generous to host us for the few days before the show and Heléne Blom lent Will Silfurtoppur to compete on. Ylva Hagander and her crew were also very helpful and nice to us. Overall we had a great time and it was so much fun to see the show and for Will to participate. 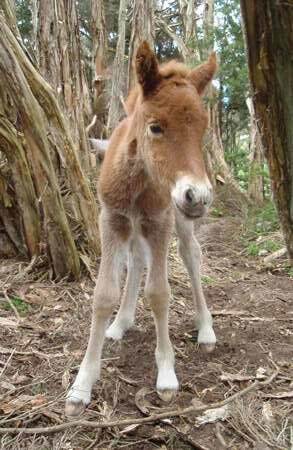 Nele e-mailed a new photo of her Hrafn daughter that was born in Australia mid October. 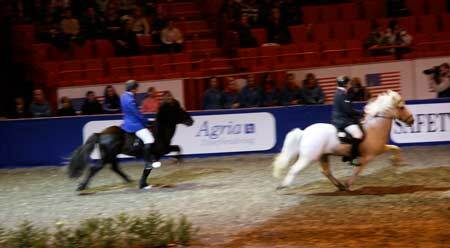 Here are the participants in the Elite Four-gait at the Stockholm International Horse Show. Will is borrowing a former World Champion in Four-Gait from 2005 Silfurtoppur frá Lækjarmóti. We are really looking forward to our trip to Sweden tomorrow and We will post photos when we get back in the beginning of December. Will has been invited to Ride in the biggest indoor equestrian event in the world the Stockholm International Horse Show held in Stockholm Sweden November 28-30, 2008. We are flying to Stockholm this weekend and have been invited to stay and train with Johan Häggberg at his farm outside Stockholm. 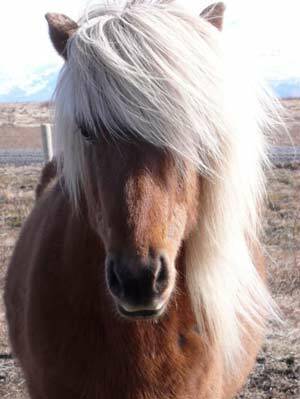 The Icelandic horses will be shown Friday and it will be a Fourgait competition. 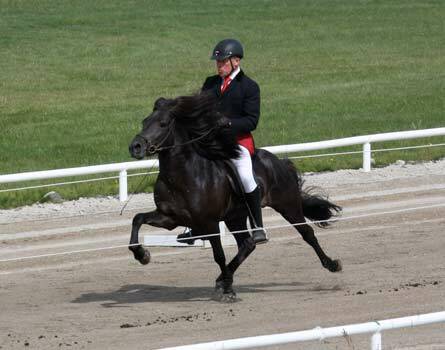 Only 6 participants are invited to represent the Icelandic Breed at this show and since USA is the theme country Will has been invited to be one of the six riders. We are really looking forward to our trip to Sweden and to see the famous show live. CIA Open was held here November 1st and 2nd and it was a great success. Everyone had a great time and it was so nice to see everyone here again. We had a BBQ in our barn on Friday Night and it was a lot of fun. Then on Saturday all the preliminaries were held and at the end of the day we had the Halloween Costume Class and then the track was opened up for the 100 m Speed Pace. There were only two of us participating and we had a lot of fun. Will and Thor had the fastest time and Lind frá Hofi (Doug's Mare) and I had the second fastest time. Sunday we had all the finals. Dynjandi frá Dalvík and I won both T1 and V1. Will rode Þór frá Litlu-Sandvík in T1 and V1 and was second in both. Stina and Kvintett were 3rd in V1 and Jasmine and Nói were 4th in the final. Thor fra Prestsbakka and I won five-gait. I rode Kani in green horse four-gait and T2. Will rode Tjaldur in T2 also and won. Lucy rode Andri in the youth classes and Intermediate Tolt (T5). She was first place in all 3 in the preliminary rounds and won T8 with a total of 8.25 and V6. She came second in T5 just behind Berta and Bjarki frá Kjarri. Thank you to everyone that helped out during the show and for making this happen. Riders from Northern California and from LA area showed up. We had 28 horse/rider combinations signed up in 14 different classes. Willy Ma a member of the LAIHA took photos and will hopefully post some of them on his website www.freehorsepicture.com. 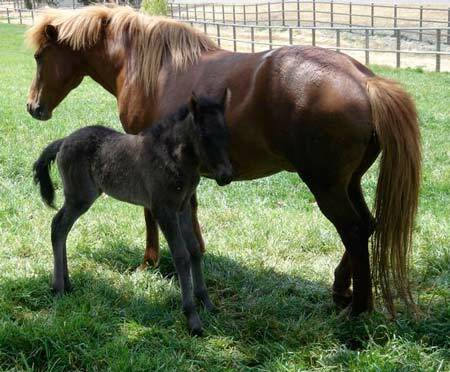 Hrafn bred a mare that went to Australia in the beginning of 2008 and her baby was born mid october. 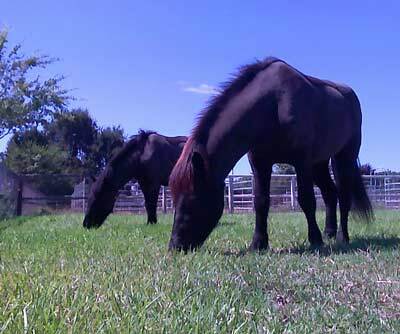 Sörli and Dynjandi enjoying the California sun and "haircut"
We have 2 new show horses here. First came Dynjandi frá Dalvík from Iceland in end of August. He traveled from Iceland to New York and then got on a truck that took him to Texas for couple of days before heading to his final destination here in Santa Ynez. He is adapting well and we think he is really enjoying his new home. Then in September we got another new horse Sörli frá Dalbæ II. He used to live down the street from us here in Santa Ynez before he moved to New York. 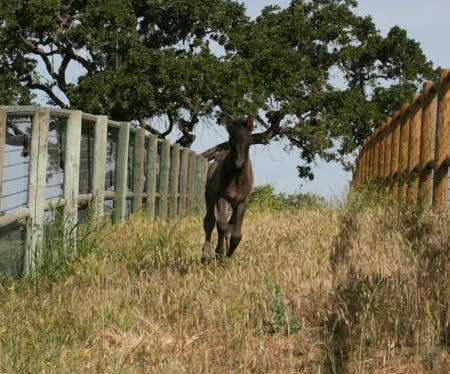 We saw him in Kentucky at Guðmar and Gígja's farm and now he is back in Santa Ynez. The first prize mare Framtíð frá Feti has been sold to Katrin Sheehan, Creekside Farm and we are going to miss her but it is nice to know she will have a great home in Georgia. 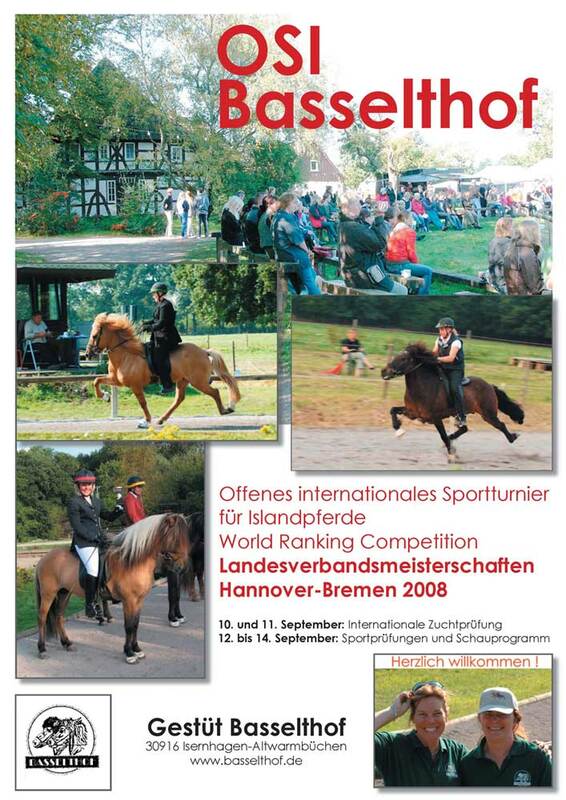 We are looking forward to the Show here in the beginning of November and we hope to see you here! For more info on the show check click here. 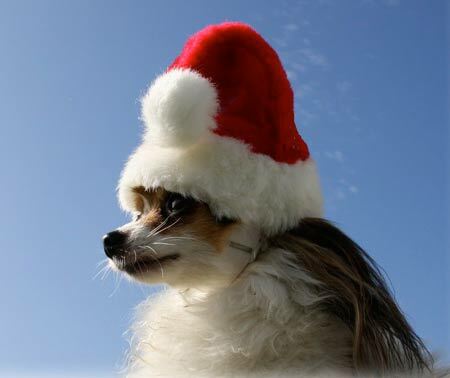 We can't believe it is September already. Only about 6 weeks till the Show here at Flying C and we have been riding a lot to prepare our horses for the show. Rune Svendsen from Norway will be the judge this time. He is a FEIF International Judge and is on the FEIF International Judges Committee as well as one of the examiner judges for FEIF. 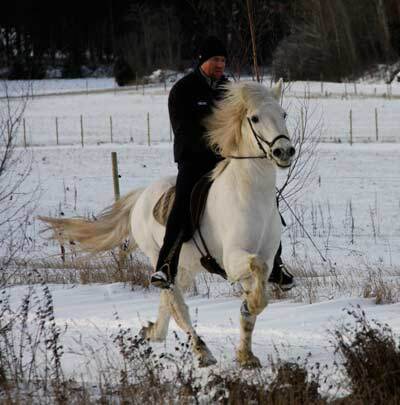 He has ridden for Norway at the World Championships as well as been a team leader for Norway. The schedule and premium has been posted on the CIA website. Go to www.ciaclub.net/ciaopen1108.html for more info and class schedule. There are couple of new classes that we have added. We have a younger Kinds Class for 10 and under both Tolt and Fourgait and then since Halloween is Friday before the show we are offering a costume class open for everyone. Everyone is welcome to dress up for the Halloween BBQ Friday night before the show. If you are coming and haven't booked your hotel yet we recommend you do so sooner than later, this area is always busy on the weekends. We hope to see most of you here! 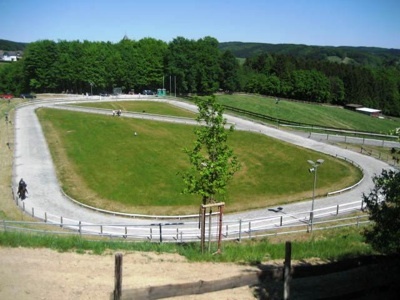 Will is now in Germany judging a WorldRanking competiton at Basselthof by Marlise Grimm. They have around 300 horses signed up and the sport competition starts Friday. 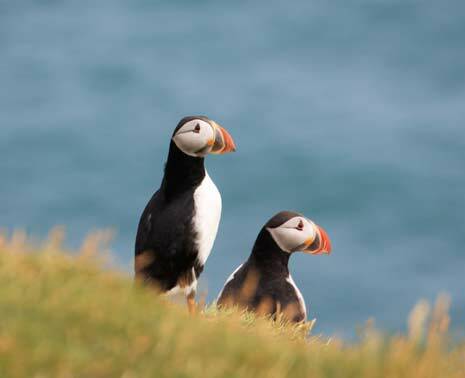 They have had a breeding show there as well. Óskin frá Feti is pregnant by Glymur frá Árgerði in Iceland and Fjöður is still by Auður. 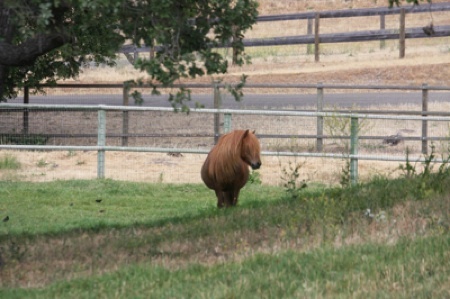 We have 2 mares in foal here in CA both by our stallion Hrafn. 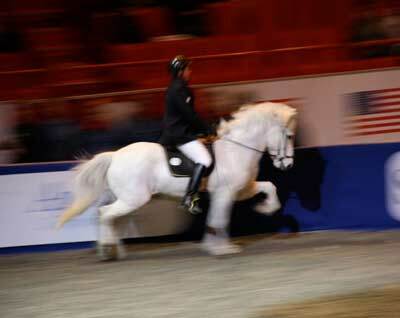 This past weekend Ylur frá Akranesi son of our stallion Hrafn frá Garðabæ scored over 8.0 in Fourgait. He would be fighting for the gold at the World Championships with these scores. Another Hrafn offspring Sunna frá Sumarliðabæ was at the same competition in T2 (loose rein) Tolt with her young rider and they were 4th in the adult class. My parents sent me couple of photos my brother took of the horses in Iceland. Eldur fra Holi my old show horse taking a rest and one of Fjodur's 2008 colt out of Eldjarn fra Tjaldholum tolting. Tjaldur and I won tolt and fourgait. Anne-Marie and Blaer were tied for first place in 4 gait with Tjaldur and I and Stina and Kvintett. In the fourgait final Blaer wasn't 100% so she showed good sportsmanship and decided to stop after the walk had been ridden. In the tolt final it ended up being just me and Laura riding her horse Holmsteinn. 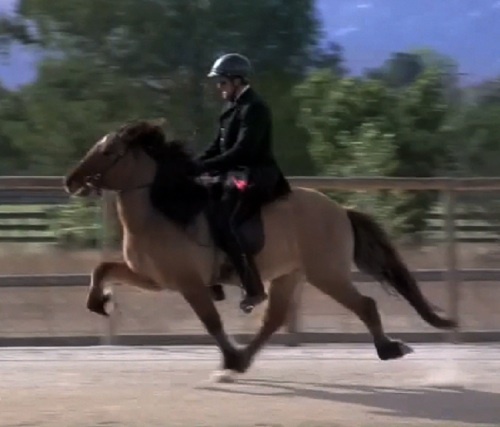 Thor and I were the only competitors in Fivegait so we rode for the experience and the feedback from the judge. 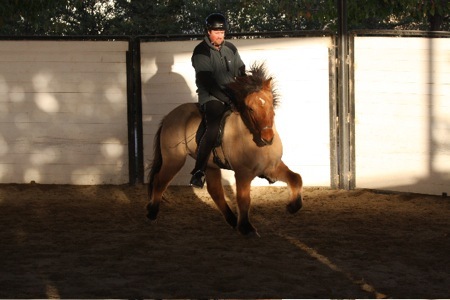 After the final I passed the reins off to Johannes and let him take Thor for a test ride. I think he really enjoyed the ride. Icelandic Championships were held last weekend in Reykjavík. Olil showed Anne-Marie's horse Dynjandi in the Master Fourgait and they made the B-Finals with a total of 7.13 tied with Siggi Sig and the Hrafn frá Garðabæ son Ylur frá Akranesi. 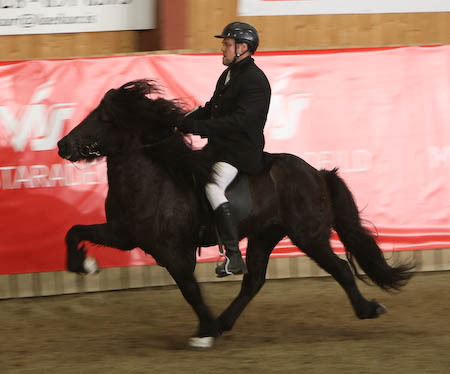 Siggi had to chose between riding him in the B-Finals or the mare Æsa frá Flekkudal in the A-finals and he chose the mare. 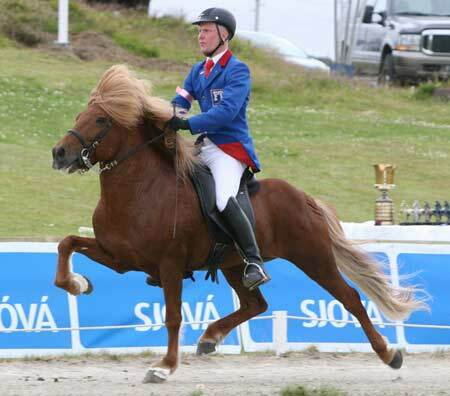 In the B-Finals Snorri Dal and his horse Oddur won and they also went all the way to the top in the A-Finals and became Icelandic Champions in Fourgait 2008. 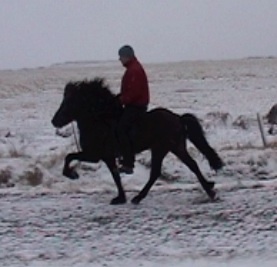 The Stallion Fjöður is being bred to this year Auður frá Lundum II was second in Master Fourgait. 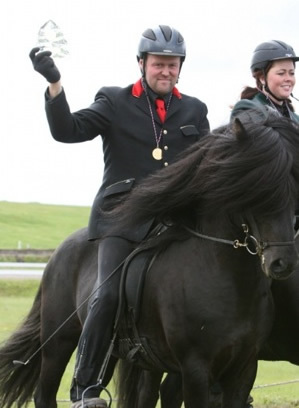 In the Master Fivegait Villandi's father Lúðvík frá Feti was second. Snorri Dal and Oddur, Olil and Dynjandi, Isolfur and Skati, Svanhvit and Kaldalons and Hulda and Tonn. Fjalladis foaled this morning here in California. 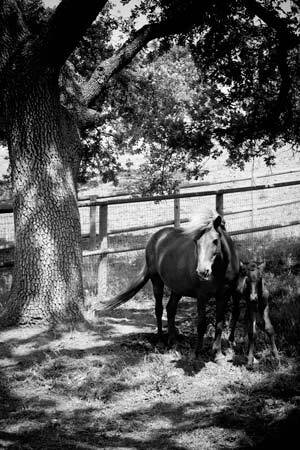 She had a chestnut colt by Hrafn fra Garðabæ. Fjöður frá Ási I foaled last weekend in Iceland and she had a chestnut colt also. The sire is Eldjárn frá Tjaldhólum. 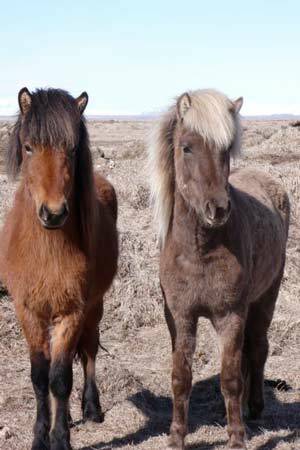 Fjöður will be bred to Auður frá Lundum II for a 2009 foal. 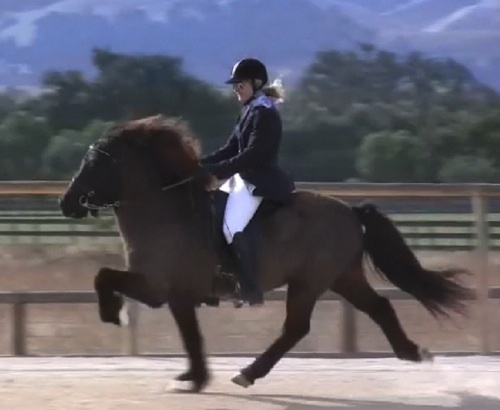 Auður is a 6 year old fourgaited stallion with 8.31 for conformation and 8.56 for talent. Including 9.0 for Tolt, trot and gallop and 9.5 for spirit, general impression and slow tolt. 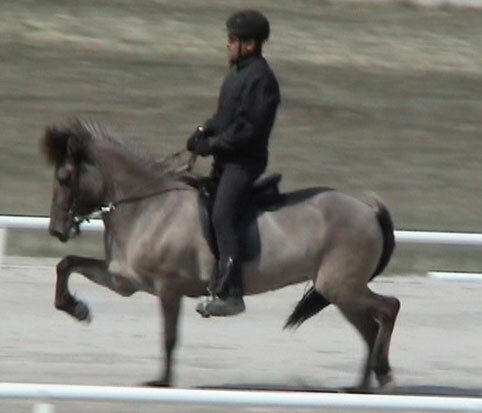 He got 10.0 for canter at Landsmót. Very exciting stallion. We are back from Landsmót and we had a great time. Landsmót was filled with top horses like always and especially the breeding horses were exciting to watch. Anne-Marie's stallion Villandi was ridden by his trainer Bergur Jónsson in the 4 year old stallion group and he got 8.11 total. 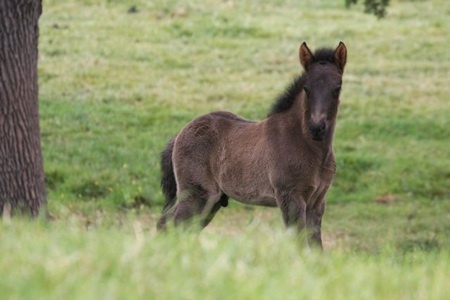 Breeding horses that qualify for Landsmót are only judged for riding abilities at Landsmót and their score for conformation stays the same as the score they were given for conformation at the qualifying show. Villandi came into Landsmót with a total score of 8.14. 7.96 for conformation and 8.26 for ridden abilities. 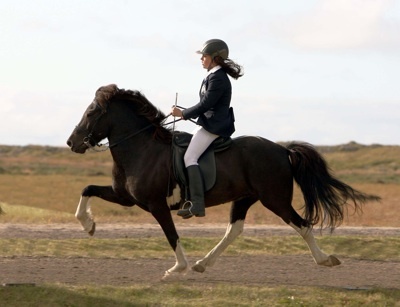 He got 0.5 lower for gallop and walk and a total score of 8.21 for ridden abilities at Landsmót. He still looked great and he is only 4 so we look forward to see how he develops next year. 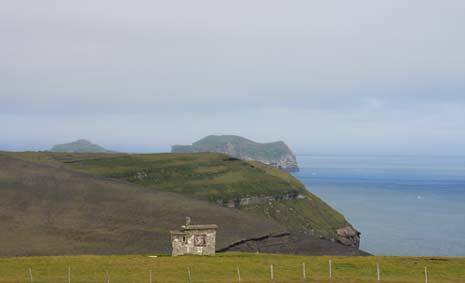 We went to visit Olil after Landsmót to see how Dynjandi is doing and we are very pleased with the way it is going. I just put an updated photo of Björk from Dalalif on the sales page. 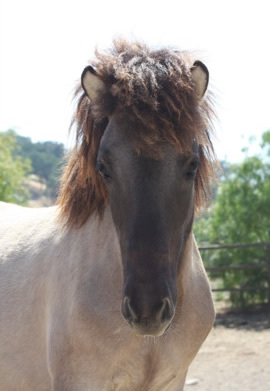 The young horses change so much and fast when they are growing up. 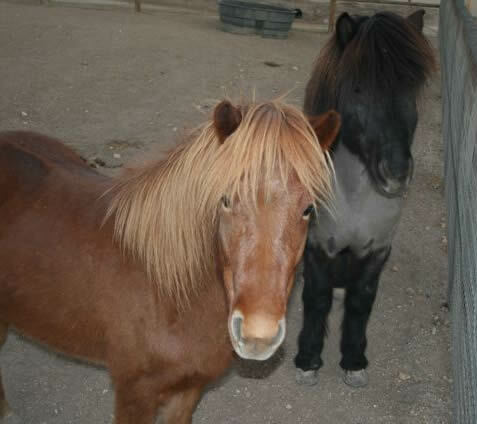 We have 2 young horses for sale both born 2007 and both out of first prize parents. Bjork's dam Fjalladis vom Wiesenhof is due in beginning of August. Fjalladis was bred to Hrafn fra Gardabae it will be fun to see what she'll have. Hrafn is really enjoying his life these days. He is out on one of the large fields with 4 mares. 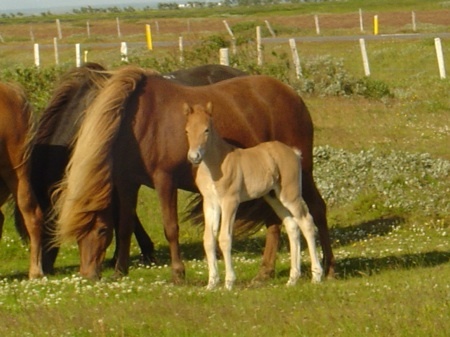 With him are Rák frá Akureyri, Framtíð frá Feti, Perla frá Rauðuskriðu and Lucy's mare Sara frá Króki. 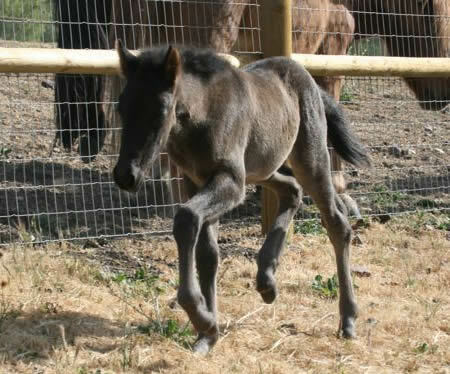 Rak's 2008 baby has been named Herkúles (Hercules) from Dalalif. 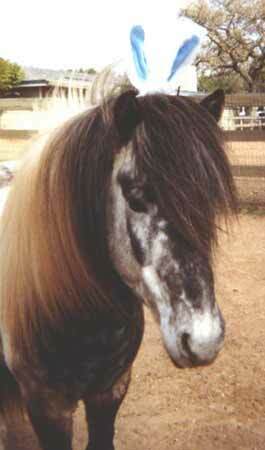 He is a son of Pegasus frá Skyggni and Rak was bred A.I. 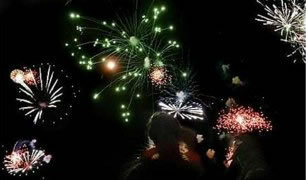 last year. We are now getting ready to go to Iceland for Landsmot in couple of weeks and we look forward to hopfully see a lot of Americans there and of course friends and family. 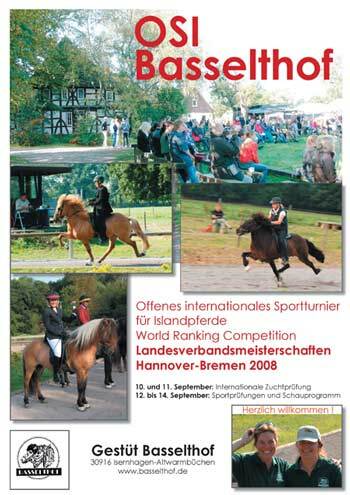 Will went to Germany last week to judge a WorldRanking competiton at Toeltmyllan Icelandic Horse Farm in the Köln area. It was a Thursday thru Sunday show with a total of 480 entrees signed up. There were 12 judges both National and International and they split the work between themselves. Click here to see the results and photos from the show in German. 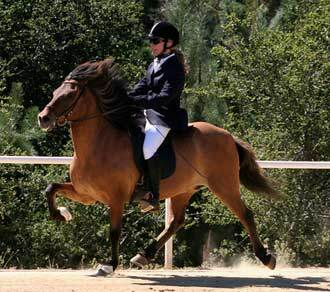 The same weekend the first semi annual show was held at Mountain Icelandic Horse Farm in Watsonville, CA. I went there to support them and took Tjaldur and Thor. Stina won V1 on Kvintett and Jasmine won T1 on Bjarki. I was 3rd in T1 and V1. Thor and I won F1 and were 2nd in T2. Lucy won Youth Four-gait and was 2nd in Youth Tolt. 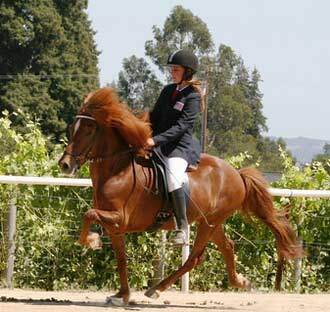 Alexandra rode Aegir in Youth Four-gait and came second. It was a lot of fun seeing everyone and we look forward to the August Show. 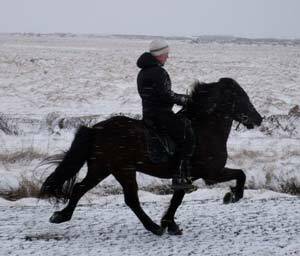 A daughter of our Hrafn frá Garðabæ made it to Landsmót this weekend with her rider Edda Rún Guðmundsdóttir. 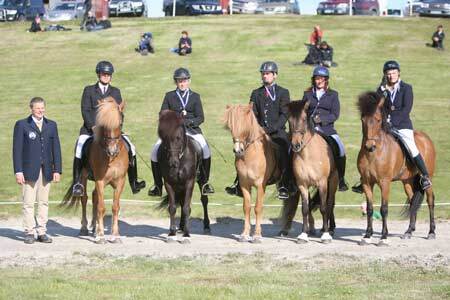 They will be competing for the Horse Club Fákur in the Youth Class. They were second place in the tryout and we look forward seeing them at Landsmót. Villandi raised for form under rider from 8.0 to 8.5 yesterday at assessment riding abilities. With that change he raised his total from 8.09 to 8.14 and for Riding Abilities from 8.18 to 8.26. 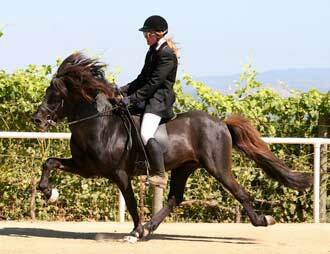 A 5 year old daughter of our Stallion Thor fra Prestsbakka went first prize at the same show yesterday. 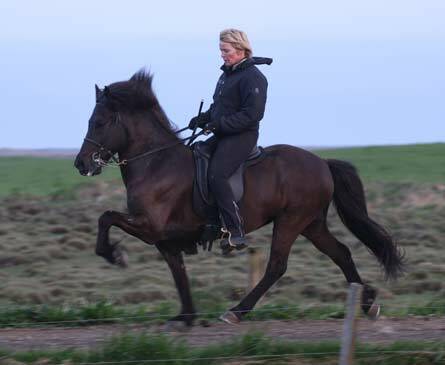 Her name is Brynja frá Bakkakoti and got 8.5 for Tölt, Gallop, Spirit and Form under rider. She got 9.0 for Slow tölt giving her a total of 8.26 for talent and 8.02 total. Only 0.03 shy of Landsmót. 5 year old mares need a total of 8.05 to make it. Villandi made it to Landsmót yesterday..
Villandi frá Feti bred by Anne-Marie was shown yesterday by Bergur Jónsson at Hella. 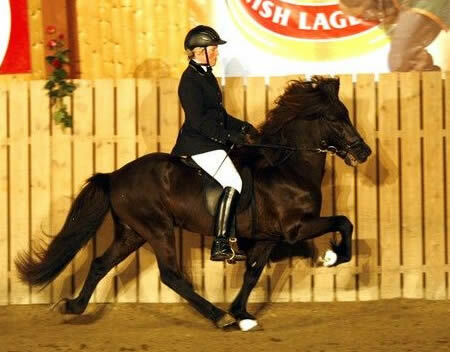 He is 4 years old and scored a total of 8.09 and qualified to be shown at Landsmót as a stallion. We are very excited and we look forward seeing him at Landsmót this summer. 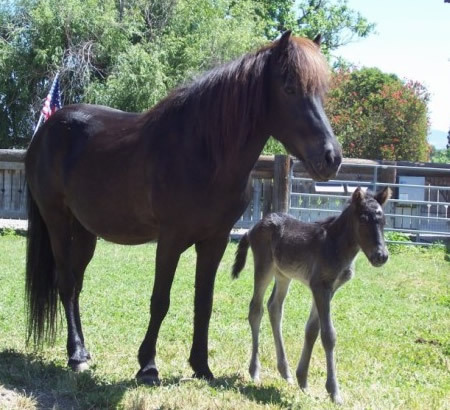 His mother is Gola frá Höfðabrekku that is here in California now and his sire is Lúðvík frá Feti who is a first prize son of Orri frá Þúfu and the Gaedinga mother Ísafold frá Sigríðarstöðum. Villandi got 8.5 for Tölt, Gallop and Spirit only 4 years old. Villandi has been in training with Olil Amble and Bergur Jónsson at Syðri-Gegnishólar this winter and will be there until Landsmót. 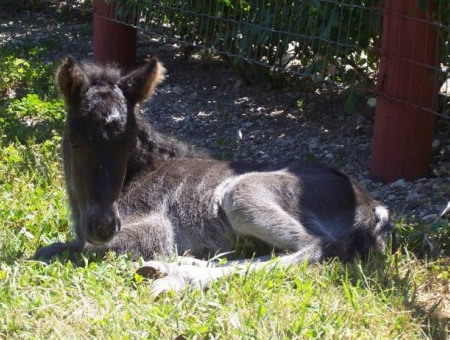 Lorrie's first prize mare Gaefa from North Salem had a colt last Sunday. He is a black/born with a star and a white sock on his hind leg. 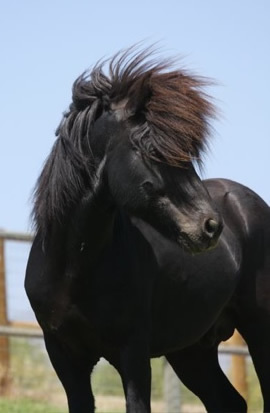 His sire is our stallion Hrafn fra Gardabae. He is Gaefa's second baby. More photos of the Rak 2008 colt..
Matti came to visit on Saturday and took some photos of the horses. He sent me these two he took of Gola and of Rak and her baby. Rak had a colt yesterday. This is her 5th baby. By the time I showed up he was up, dry and already nursing. He is Black/Brown with no markings. 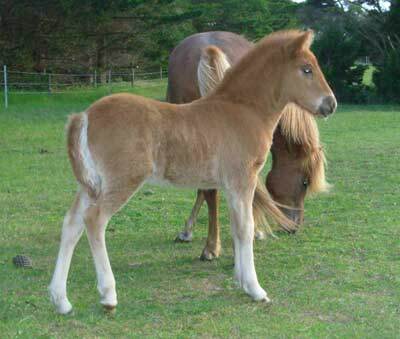 His sire is Pegasus fra Skyggni and Rak was bred A.I. I will post more photos this week. 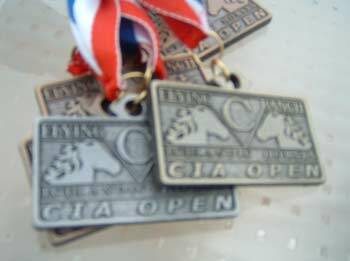 CIA Open was held here May 3rd and 4th and it was a great success. For the first time we offered a 2 day judging seminar that riders were offered to participate in to learn what the judge is looking for when we are competing. It was a great seminar and i think we all learned a lot. Everyone had a great time and it was so nice to see everyone here again. We had a BBQ in our barn on Friday Night and it was a lot of fun. Then on Saturday all the preliminaries were held and at the end of the day the track was opened up for the 100 m Speed Pace. There were three of us participating and we had a lot of fun. Will and Thor had the fastest time and Dynur and I had the second fastest time. Sunday we had all the finals. Thor fra Litlu-Sandvik and I won both T1 and V1. I rode Hrafn also in the preliminary round V1 and I had the highest and the second hightest scores in the preliminariy. Will rode Tjaldur in T1 and they had the second highest score in the preliminary and Jasmine and Bjarki tied them in the final. Thor fra Prestsbakka and I won five-gait. I rode Framtid in green horse tolt and we scores 6.3 and Kani and I entered green horse four-gait and scored 6.5 for trot and walk and 6.0 for Tolt and canter and a total of 6.3. Riders from Northern California and from LA area showed up. We had 35 horse/rider combinations signed up in 14 different classes. We had a silent auction to raise money for the Youth Riders going to this years Youth Cup in Switzerland and we raised a total of $951 that we will split between the 3 girls going. Heather Skopik a member of the LAIHA took a lot of photos also that I'm planning to post on the CIA Website and Willy Ma also a member of the LAIHA took photos and has posted some of them on his website www.freehorsepicture.com. Heidi Benson took a lot of photos and will post some of them on her website GoldminePhotography.smugmug.com. In the below image of a horse back, increased body temperature is indicated by the red tones. The below ”after” image depicts the successful reduction of inflammation. Degrees and rates of pain relief will obviously vary on an individual basis, due largely to the differing nature and duration of existing aliments. 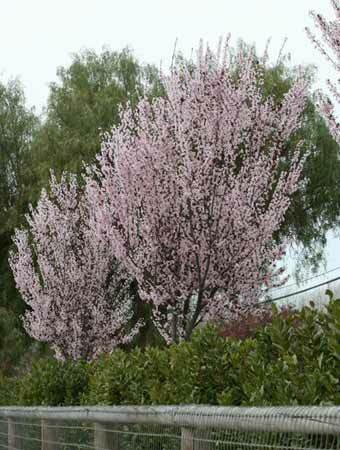 can be seen as a sign of inflammation. After 30 minutes of using the blanket, the blood supply to the area is increased dramatically. The desired result, after 10 days - 3 weeks of use, where the inflammation has subside. 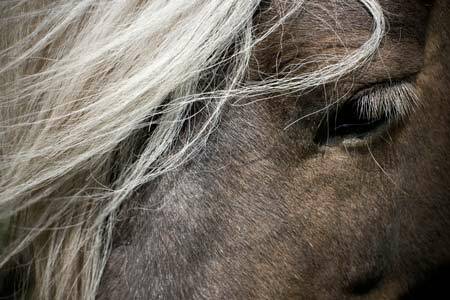 A blind study on horses with chronic back problems showed that they had a 50% improvement of the movement capability after three weeks with Back on Track. In another clinical study with 120 people who suffered from mouse arm, worn-out knees and arthrotis showed that the pain eased for more than half of the subjects. In the below image of an elbow, increased body temperature is indicated by the red tones. The below ”after” image depicts the successful reduction of inflammation. Degrees and rates of pain relief will obviously vary on an individual basis, due largely to the differing nature and duration of existing aliments. Before using the elbow brace, the red area can be seen as a sign of inflammation. After 30 minutes of using the elbow brace, the blood supply to the area is increased dramatically. The desired result, after 10 days - 3 weeks of use, where the inflammation has subsided. We will be offering Back on Track Products both for Humans as well as Horses. E-Mail us if you have any questions or check out our tack shop link for more info. We went to Iceland for few days last week. Will went to Hvanneyri to the FEIF International Judges meeting and Anne-Marie and I went and looked at the young horses as well as Dynjandi and Villandi at Olil and Bergur's place. 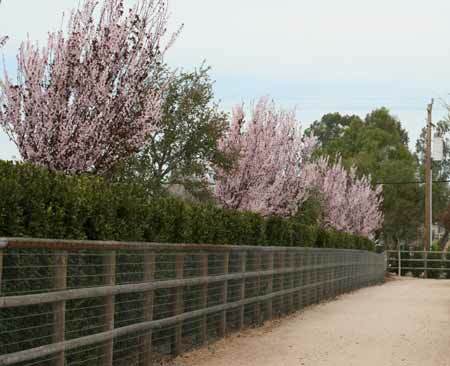 We are very happy with the horses and Villandi is coming along very nicely. Villandi is a son of Gola frá Höfðabrekku and Lúðvík frá Feti and is born 2004. 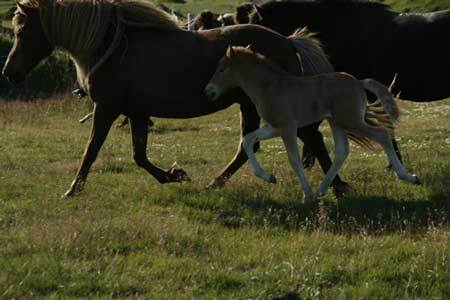 The young horses are at my parents land Melbakki in Þykkvabær area. There are 4 of our horses there. Fjöður is there and she is in foal by Eldjárn frá Tjaldhólum, Óskin frá Feti (S. Orri frá Þúfu D. Gola frá Höfðabrekku), then there is another Gola daughter by Aron frá Strandarhöfði born 2005 and a Fjöður daughter by Víðir frá Prestsbakka (S. Keilir frá Miðsitju D. Gleði frá Prestsbakka) she is born 2006. The 2007 babies are in town at my parents barn. 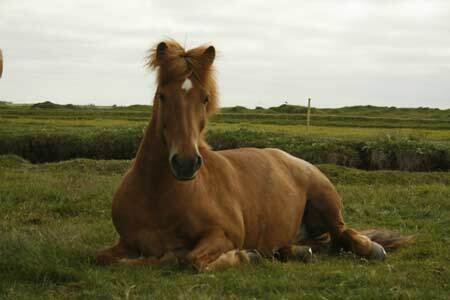 I have added Fjöður and Óskin to our Mare page. Click here to check it out. Also we have a date for our Fall show. Mark you calendar for November 1st and 2nd. Last weekend we were in Georgia at Katrin Sheehan's place for the Annual Meeting. 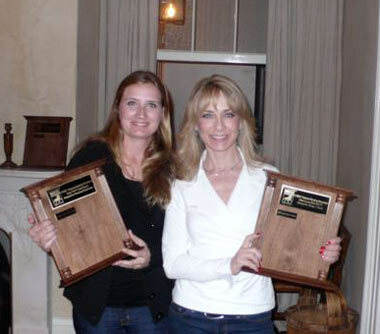 At the dinner David Kline presented the National Ranking system for Sanctioned Shows and gave out the awards. Anne-Marie won the T2 for the year and I got T1, T3, V1, V2, F1 and F2. I found this old photo of Aegir fra Byrgisskardi. This photo was taken before he was sold to Alexandra Venable. Funa has been here with Hrafn since November and will leave over 3 months pregnant for Australia March 27th. She left here for Quarantine Saturday and will be there before flying to her new home. 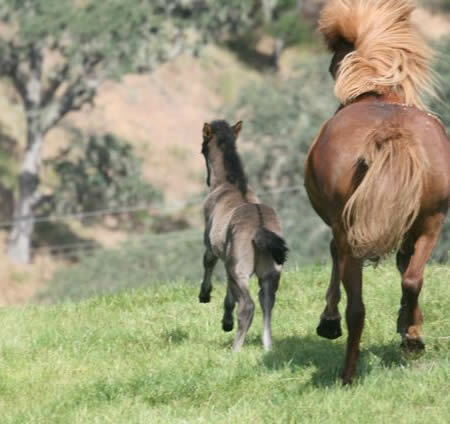 We look forward seeing the Hrafn baby grow up in Australia. Go to our photo page to see more new photos. 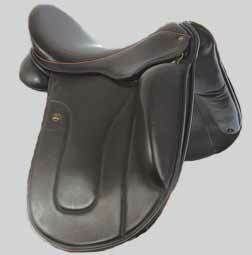 We have a new Astund saddle now available the Ástund Xenophon. Go to our tack pages to see more info. 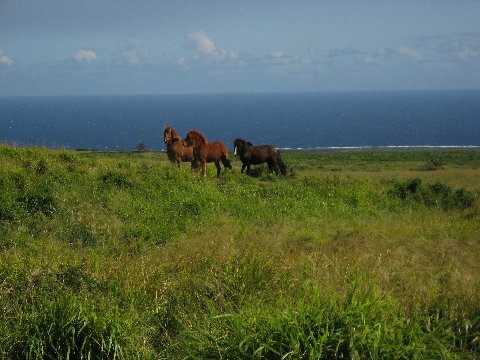 Sif from Flying C Ranch (center) enjoying her beautiful view in Hawaii. 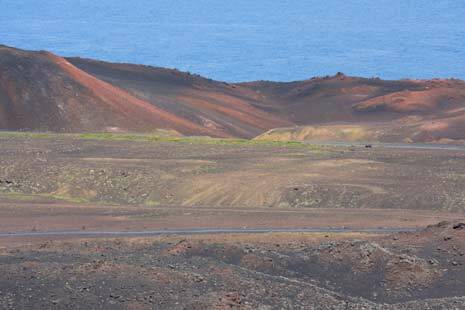 Sif's owner Eloise sent us an update on Sif from Hawaii. 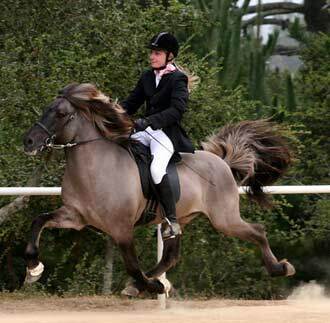 She is the 2006 daughter of Perla fra Rauduskridu and Hrafn fra Gardabae. 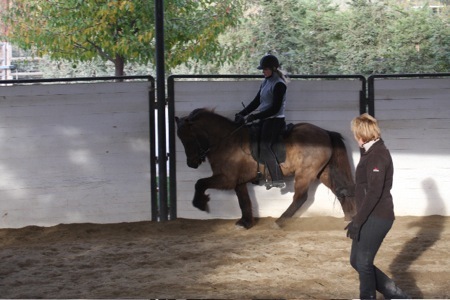 She is already 13.3 hh. Sif left for her new home on the Big Island in Hawaii last April. Lucky her! We have added 4 new sales horses on our sales page. 3 are born 2007 and all out of first prize parents and one show horse gelding. 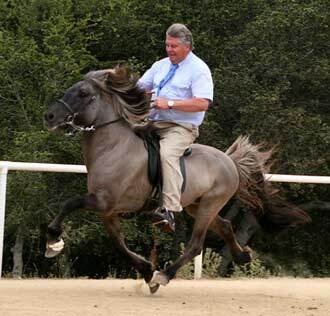 Ylur frá Akranesi a Hrafn fra Gardabae son wins four-gait at the first Masters competiton. After placing 8th in the preliminary Siggi Sig riding Ylur won the B-Finals that gave them the right to participate in the A-Finals and they went all the way and left with victory! There were many of the top fourgaiters signed up such as Kaldalons fra Koldukinn who was second in fourgait Master level at the last years Icelandic Championships, Vaenting fra Ketilsstodum who was the Icelandic Champion last year in fourgait open level, Tonn fra Hala who was third in fourgait master level at last years Icelandic Championships, Rokkvi fra Harlaugsstodum who won Landsmot 2004 B-Class and many other top show horses in Iceland.